8" x 10" printed on photographic paper, suitable for framing. These Images are available for $9.95 plus shipping and handling. This is a Drawing of a rare photograph taken in Tombstone prior to the fight at the O.K. Corral. 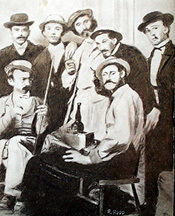 It shows from L to R, standing, Doc Holiday, Tom McLaury, Ike Clanton, Morgan Earp and Billy Clanton. Seated, Luke Short on the left and Wyatt Earp. Virgil Earp and Frank McLaury, the other two participants of the famous shootout, were not present. Tom McLaury, with Dock Holiday's arm over his shoulder was killed at the gunfight along with young Billy Clanton. Price $9.95 plus shipping and handling. This reavealing photo of Josie Earp was probably taken in Tombstone and indicates that she was probably a dance hall girl or such. Few women posed this way in the1880s. 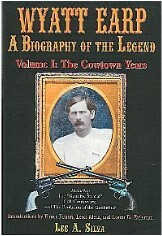 Author Glen G. Boyer used this photograph on the cover of Josie's biography, which he edited and entitled I Married Wyatt Earp. Price $9.95 plus shipping and handling. The most famous cowboy Silent Screen film actor, and a good friend of Wyatt Earp. William was one of the pallbearers at Wyatt's funeral. Drawing by Bob Hupp. Price $9.95 plus shipping and handling. 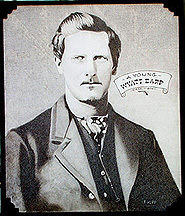 One of the earliest pictures of Wyatt Earp, when he was in his early 20's When a buffalo hunter with Bat Matserson. 10 million buffalo were killed in 10 years. Price $9.95 plus shipping and handling. This drawing is of a photograph that dates back to 1871 as is known as the Dodge City Peace Commission. The original photo sold for $89,000 at an auction last year. 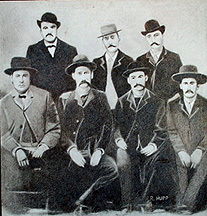 Standing l to r W. H. Harris, Luke Short, and Bat Masterson, seated C. Bassett, Wyatt Earp, Nick Neal, and Neal Brown. Only $9.95 plus shipping and handling.